Description: The boy with the monkey tail, Son Goku, seeks out Master Roshi the turtle hermit in order to become his apprentice. However he gains a rival in the newcomer, a young but skilled martial artist named Krillin. Roshi decides he only wants one apprentice so he makes it into a contest: Whoever can save the legendary sleeping princess from the evil Count Lucifer's castle becomes his underling. Continuing the trend set by Curse of the Blood Rubies, we're once again dealing with an alternate retelling of what is among fans known as "The Master Roshi saga". 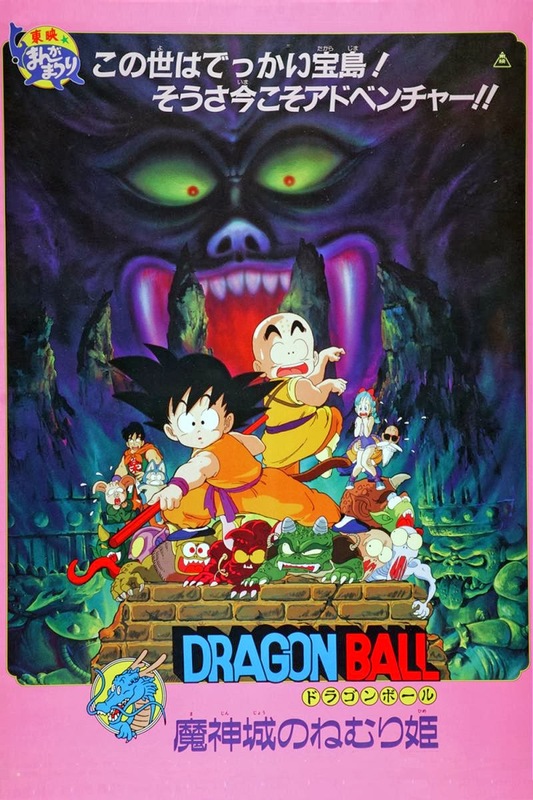 This is the story set immediately after the saga which Curse of the Blood Rubies was based on making this one of the few direct Dragon Ball movie sequels plus it's an indicator that at this point in the production of the tie-in movies they were trying to establish the movies as their own separate universe - but I'm getting ahead of myself. In this story, instead of telling how Krillin and Goku trained under Master Roshi the story turns into a fairy tale adventure with our heroes raiding a demon's castle. This is a step up from the former movie in quite a few ways, first off the setting is much more fantasy-like with the castle being larger than life and filled with statues of monsters - for a kids movie it actually manages to be very creepy even if most of it is just differently colored backgrounds. The setting of the movie being amongst demon's also allows for much more imaginative designs and while they didn't take the concept and run with it, it is a step-up from the very plain character designs of it's predecessor. A lot of modern fans tend to ignore this, but at this point in time Krillin was the closest Goku had to a rival, a spot that would later be taken by characters like Piccolo or Vegeta. While I love those two characters as much as any Dragon Ball fan, this movie reminded me of how closely Goku and Krillin used to resemble each other in strength. Other characters make an appearance as well, as an example Bulma does pay a small part in the story but for the most part it focuses on the adventure of Krillin and Goku. The villain this time is a Count Dracula type character named Count Lucifer, there's not really much to him - his motivations for doing what he does is barely explained and in a movie where most of the new designs are pretty interesting to look at he makes for the most boring design of all. I found myself being kind of taken aback by how boring he looks. At the very least the rest of the movie makes for much better entertainment so he amounts to a small failing at best. The humor of the movie is pretty good as well, once again playing on how much more naive Goku is opposed to everyone else. The entire reason for Master Roshi to send them out for "The Sleeping Princess" in the first place pretty much amounts to him being a giant horndog so while the reasons behind the adventure on both sides are kind of dumbs, at least the actual action scenes, while not as good as in most other Dragon Ball stories, make for some pretty cool and funny moments. One of my main complaints for Curse of the Blood Rubies was the lack of the series sci-fi element and on that pedestal this movie is even lower, there is next to no indication whatsoever of the cool science fiction this series would later become in that most of it takes place in a medieval castle, however this time it didn't bother me as much because of the higher dedication to sticking to one setting in this film. Artwise the movie is also a lot more vivid, the high amount of silly faces from the original series makes it mark in much higher amount here and it results in a bigger emphasis in carrying over the style - a lot of this actually looks like a Toriyama drawing instead of just an imitation by the animation studio in question. On the voice acting side I once again watched the dubbed version. While there is a pretty good performance from the regular cast I wasn't overly fond of the performance from most of the newcoming characters especially that of our main villain who, combined with a poor design, just came off as bland. This is really sad because the villain is voiced by Mike McFarland, the same person who voices Master Roshi with whom he actually did a pretty good job. Overall the film turned out to be a fun little fairy-tale adventure - however it fails to make the stakes feel all that high at all and that makes for a major problem in a show centered around a superpowered martial artist riding on a cloud. I'd say watch it for a doze of that Dragon Ball humor but don't expect as good storytelling as in most other outings for the series. If not purely for curiosity's sake, there isn't much else to find here.